New beginnings @thefarmathokuala - 100% homegrown and organic food for the residents and restaurants @hokualakauai and always for the local Kauai ohana. Building a sustainable future one tree at a time. 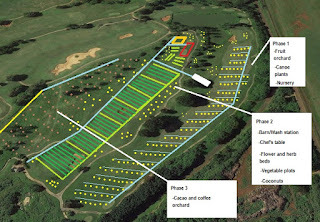 Flipping an old golf course into a food forest. 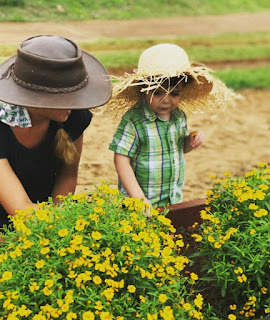 Come grow with us! It's been awhile, to say the least. I left Steelgrass Farm (now Lydgate Farms) in 2016, where I created 2-acre vegetable garden and learned how to manage a cacao orchard. Learned how to graft cacao trees, pollinate vanilla, ferment cacao beans, hunt and butcher feral pigs. Chef Adam @hanaikauai taught me how to smoke the meat with kiawe and lilikoi. I was destined to live off the land, but things change, and it was best to move on. In June of 2016 I moved the family to Rising Sun Farm (for photos visit the IG account @farmercodylee) where I made use of a couple acres to provide lettuce, microgreens and edible flowers to the east side of Kaua'i. 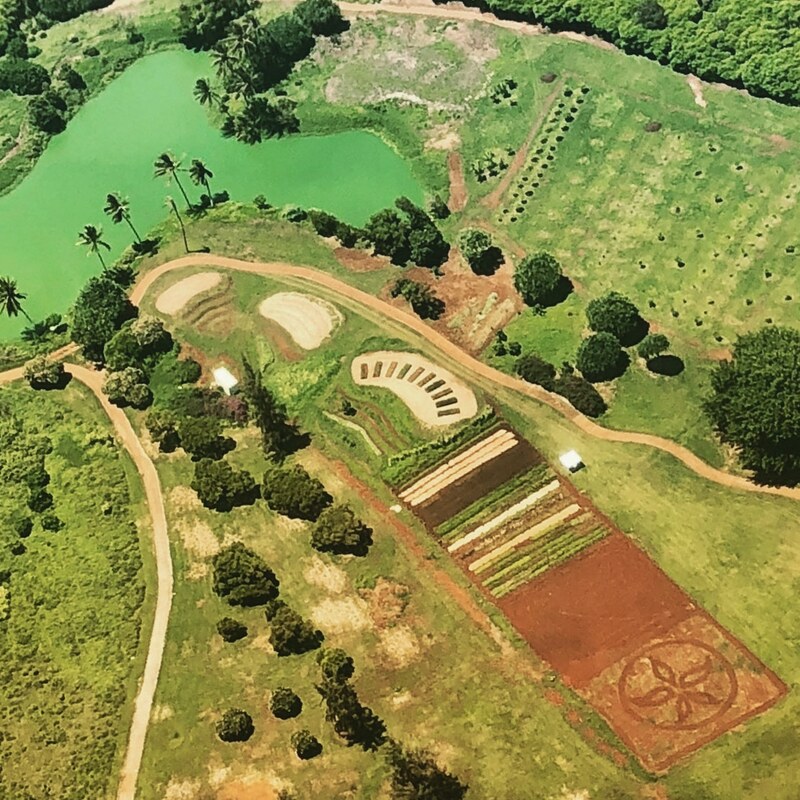 Moloa'a, Kaua'i has a beautiful red dirt, and I am thankful to have farmed next to over one hundred volunteers over the years. 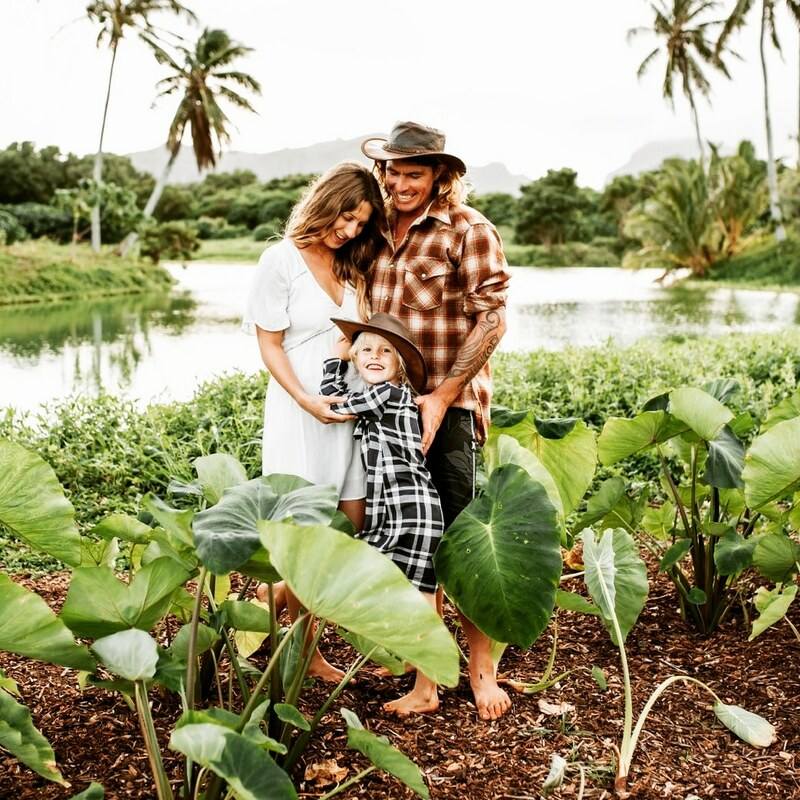 They taught me about life, I taught them about growing lettuce on Kaua'i. 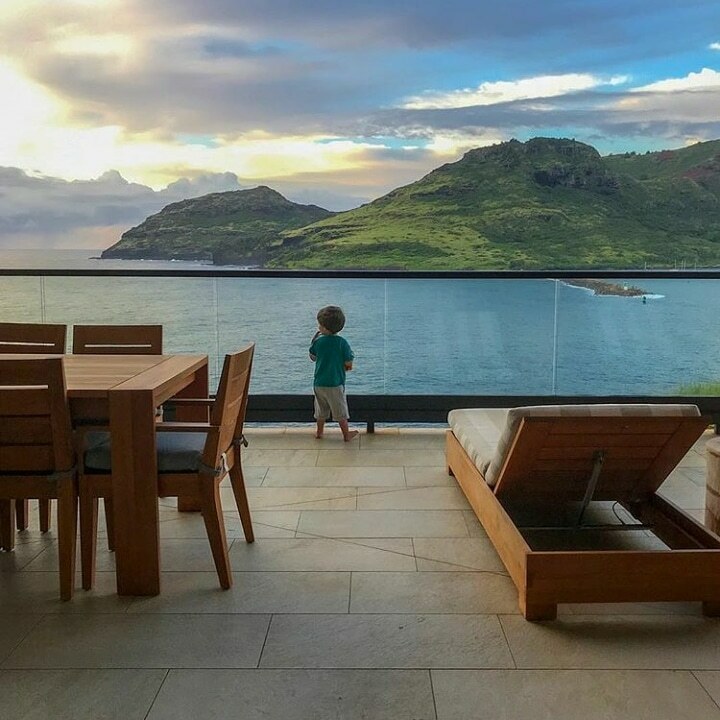 My daughter and I were in need of a bigger living space, and a friend was willing to take over the lettuce fields, so we bid farewell to the Rising Sun and moved towards the Rising Star... a.k.a. 'hokuala' in Hawaiian. 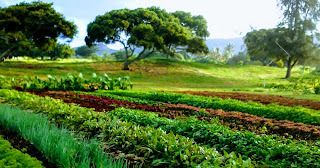 Now, we are the Farmers at Hokuala Resort (@thefarmathokuala and @hokualakauai). I'm looking at over one hundred acres of old golf course land, and want to turn it into a food forest, market garden, foodie paradise, sustainable farm. I'm starting small, with just a few golf fairways... but, dreaming big... currently in the middle of finishing Phase 1 of the Hokuala Farm project... with over 150 fruit trees in the ground and a hundred more to go. Life is good. While drilling a hole in the bottom right molar, the dentist informed me that darker color pigmentation in 'greens' means more nutrients. If it means better health for us all then I shall grow more purple, red and dark green greens. Bicolor shiso. With shiso comes mejiso (little micro shiso) and hejiso (flower tips). Both used as a garnish. I'm also experimenting with cutting shiso tips, like basil or mint tips, for garnish and mature shiso for table top flower display (that one could eat) and shiso seed for pickling. Hey, can I use the roots for something? Hanai has created a twist on sea salt blends and made 'Shiso Salty' finishing salt. Gida also dehydrated some of our giant purple mustard greens and put them in the blend for a bit of a wasabi kick. The original colored carrot blend. Mature purple mizuna. This also comes in micros. Spicy when old. A salad mix of all the greens in the fields. Beets, shiso, kale, lettuce, arugula and mizuna. When the rows were young. As the purple variety goes to seed it starts to fade into green. The flowers of shiso (hejiso) are very aromatic and edible, too. I found a beautiful mutant leaf today that had the shape of a butterfly. This plant tastes like licorice mint. Can cut the whole plant at 1" tall for mejiso, or let grow to adulthood and harvest primo leaf then flowers, then seeds for pickling. A very all-around wonderful plant to have in the cupboard. When the purple leaf sits beneath the sun there's a metallic rainbow shine to it. I've truly never seen anything like. Maybe I've been starring at lettuce for all too long. The new favorite lettuce type. It has a striking color and forms lovely small heads that can be cut in half and grilled/sauteed, just like any compact green romaine. First, a spoonful of butter, sizzling in a cast iron skillet, then cut half a head of lettuce and plop face down on the pan. Sear for a couple minutes on each side. Take off heat, face side up add a rizzle of lilikoi vinaigrette, sprinkle of island goat cheese and honey glazed wild boar bacon bits and oh my. Want to get really fancy use duck fat instead of butter on the lettuce and be sure to give it a nice crank of green peppercorns from the backyard. The two faces of 50/50 shiso. A whole flock of kale. Free kale. Anyone? The story goes... when I got it, nobody wants it, when I don't have it, everyone needs it. Not growing any more kale. My teeth are green from it. The local juice bar's juicer died and they don't want the kale anymore. Goodness, I can only eat so much. There's more than just teeth that have turned green. For lunch I grab mizuna and lettuce, then wrap it into a big kale leaf. The ultimate green machine burrito. Where's a goat when I need one. The kale got so big it became a colony for unwanted aphids, green worms and the leafs were getting this white rot that our pumpkins usually get.... so I chopped all the kale. It's now growing back in little leaves that are great for salads. Freckles lettuce going to seed. Also, not growing anymore of this, because, it goes to seed in less than three weeks. I get to pick a few leaves then it's like, ''Adios!" Ciao. Yes, I talk to the lettuce. Freckles is pretty, but has no weight or longevity. Monster purple mustard green. Tastes like wasabi. Good in spicy kimchi. African basil. I have three small plants that I'm growing to mothers, then will make many many clones of one day. Garlic scapes. The only ones to be found on our island. 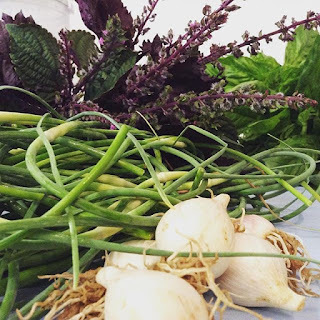 Being used in place of garlic to open up the doors for local, organic garlic flavor. The companion real garlic is coming soon. Whenever the trades come I get waves of aroma of garlic and shiso while in the nursery. Smells like a vampire slayer that just brushed his or her teeth. Garlic scapes, aka flowers. Cut the flower after it does it's first bend and it will send a signal to put more energy into the bulb formation. At least, that's the plan. There's always a difference between a plan and the execution. The garlic is in the final month or so before harvest. I lost more than half the crop since I planted it at the beginning of the year... some of the seed was rotten, or too little... then the pigs came one night... and then the chickens are always there... then I was away for a few weeks... now I'm back, and it's hot and dry... and the garlic is still unsure of where it's at. Once the solstice hits the garlic will go into decay mode and before then I will likely need to initiate a premature birth of garlic. Every farmer says garlic no grow here. It does, so far, but I do feel the challenges. I could pull what's there now and offer homegrown organic garlic to the community that's small and petite, or wait and see how big they will get before the solstice. I found one this morning that has four cloves and bigger than the size of a golf ball. With the scape cut a week ago the bulb is swelling rapidly... how big will it get? Here's a pic Hanai posted yesterday of shiso and garlic party we're having. 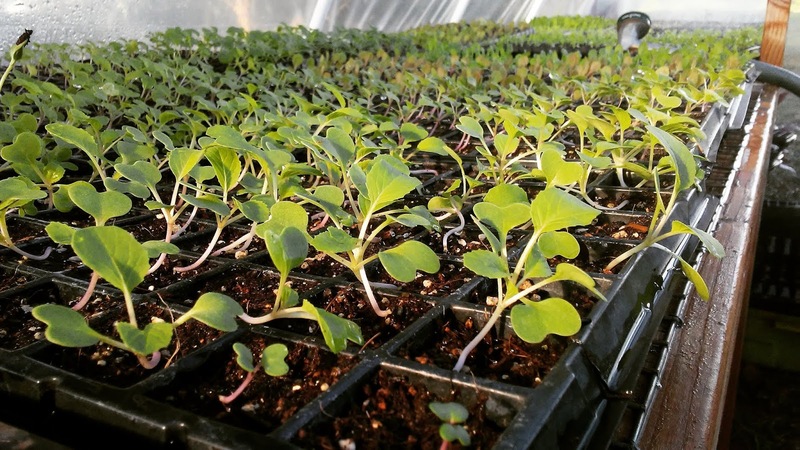 Micro arugula. Chefs like small things. Molecular gastronomy. Little green neutrons. The heirloom blue corn from New Mexico... before the pigs ate it last night. Sometimes I pull up to the fields and I see piles of fresh dirt. I walk over and find causalities. Dead vegetables with the sweet bits eaten and the rest of good stuff trampled on. Enjoy it pigs cause the farmer has a new old Bear Grizzly long bow on the way and I'm bought ready to get ninja on y'al hogs. The pig to human ratio on the island is 9 pigs per every human. That's about 63,000 wild pigs and for every pig there's probably 90 chickens. I planted two thousand corn, a few thousand oat, thousands of Billie's beans and I left for two hours and when I came back there were many fat roosters staring at me and pooping all at once. Faced with an army of chickens that won't sleep until every seed is eaten and converted to rich fertilizer I turned my back and walked away. Awapuhi ginger? The best natural shampoo. Purple mizuna rising towards seed.